What is the most challenging hike you’ve accomplished? When have you had a downhill experience, physically or spiritually? How does the security of your footing change when you are confident with God’s commands and uncertain about what you’re doing and where you’re going? When you hike in the hills or mountains, you’ll get a fresh perspective with every twist and turn. The goal is to get to the summit, where you’ll have unobstructed views, being able to see for miles with fresh air swirling around you. Even though your muscles and lungs burn along the path, you accomplish something with each and every step. You stop for a break, sip water, refuel with a power bar, and continue to ascend. Every step takes you a little closer. You watch your step. Your excitement and anticipation grows. With every challenge, you grow. You develop. Then you reach the top and savor the moment. You breathe and take it all in. You soak in the sights…and the accomplishment. But you can’t stay on the top forever. You have to get back to where you live. It’s time to move back down the mountain. It seems easier. After all, going down definitely seems to involve less resistance. Shouldn’t it be almost like coasting? The truth is, many more accidents happen on the way down the mountain than on the way up. We don’t pay attention. We’re not as careful. We’re tired, and the climb down is anticlimactic. There’s really not a lot to look forward to it—except survival, a bath, and a good meal. But if we don’t pay attention to where our feet go, we’ll step on loose rock, we won’t have our feet firmly under us, we’ll slip. And falls on the way down can be disastrous because they’re more difficult to stop. Momentum carries us. We can slip into others. We twist an angle or stress a knee. Tired muscles ache and cramp. But we can’t quit. God will guide and give us everything we need, but we can’t get lazy. Focus. Be intentional with each and every step. Take a hike. It doesn’t have to be extremely challenging or time-consuming. Let God guide. Be careful with your steps but also bold as you proceed. When you move forward in God’s will, you can be secure even with the uncertainty involved. You won’t always be safe, but you can step into God’s confidence. He will show you sights and sounds you wouldn’t have experienced without Him. Posted on November 27, 2014 October 6, 2014 by SusanHLawrencePosted in Adventures in FaithTagged accountability, adventure, daily challenge, daily devotional, daily reading, discipline, faith, friendships, mentoring, reflection questions, training, womens ministry. 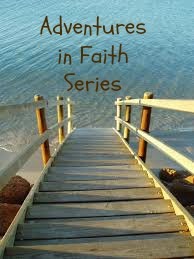 Next Next post: Adventures in Faith: Bench, Floor, or Field?